This letter was probably written between 1120 and 1135 by a person only known as Hugh. It may be the theologian Hugh of St. Victor, or it may be Hugh de Payns, first master of the Temple. The quality of the Latin is assumed to be too poor for Hugh of St. Victor and too good for a knight like Hugh de Payns: but Selwood and Cerrini have recently argued that the author was Hugh de Payns. The author has good knowledge of the Bible, which suggests an education in the Church, but also opposes the traditional Christian idea that the only way to win salvation is to enter a monastery. He argues that the active life is just as pleasing to God as the contemplative life. This suggests that the author is a knight. 1) The writer begins by urging the Templars to remain in their present vocation. Citing Biblical texts, he explains that their function is essential for Christendom, the ‘body of Christ’. 2) He goes on to explain that the devil is trying to undermine their vocation by suggesting that their motives are wrong. He justifies their taking of plunder by comparing them to preachers, who are paid to preach the Gospel. 3) Having failed to undermine them in this way, the devil then tries to persuade them that their vocation has less spiritual value than other vocations. If they want to progress in the spiritual life, they ought to leave and join a contemplative order. 4) The writer points out that what matters is the sort of life you lead in the order where you already are, not which order you are in. 5) He argues a cogent case in support of the active religious life; unusual for this period, when the contemplative life (life of wordless meditation and silent prayer) was the Christian ideal. 6) Still arguing against common belief, our writer declares that the true Christian can find the necessary calm and peace in the activity of life. 7) The Templars should not think that God does not recognise their efforts, simply because the Christians in western Europe seem to have forgotten them. Everything in brackets has been added by the translator. HUGH THE SINNER TO THE KNIGHTS OF CHRIST IN THE TEMPLE AT JERUSALEM WHOSE DEVOTION MAKES THEM EAGER TO SANCTIFY THEMSELVES BY LIVING A RELIGIOUS LIFE. FIGHT AND CONQUER AND RECEIVE THE CROWN IN CHRIST JESUS OUR LORD. Here begins his sermon to the knights of the Temple. (1) Dearest brothers, the more the devil looks for the opportunity to deceive and subvert us, the more careful we ought to be not only to avoid evil but also to do good. For the devil’s first aim is to draw us into sin; the second is to corrupt our intention to do good; the third is to to make us unstable in good by distracting us from our plans of virtuous action under the pretence of making progress. To guard us against the first deception, Scripture says: ‘Son, watch out that you do not consent to any sin’. [Tobit, ch.4 v.6.] To guard us against the second, it says in another place, ‘Do good well’,[corrupted form of 1 Thessalonians 5 v.21?] – for whoever seeks their own glory rather than God’s when they do good deeds is not doing good. Elsewhere it says, to guard us against the third deception, ‘Stay in your place’, [Daniel ch.10 v.11.] as if the person who does not wish to stay in their place is the one whose unstable mind and changeable desires are always dragging them away from whatever they ought to be doing to do something else. To correct this instablity and irresponsibility the Apostle [Paul] said, ‘Each person should remain in the calling in which they were called’. [1 Corinthians ch.7 v.20] ‘One has this gift and another has that’. [1 Cor. ch.7 v.7.] See, brothers, if all the parts of the body had the same duties, the body could not survive. Listen to what the Apostle says: ‘If the foot should say, “I am not an eye, therefore I am not part of the body”, isn’t it still part of the body?’[I Cor. ch.12 v.15.] Often the things which are most humble are most useful. The foot touches the ground, but it carries the whole body. Don’t deceive yourselves: everyone receives the wages for their labour. The roofs of houses receive rain and hail and winds; but if there were no roofs, what would the painted panelling inside the house do? (2) We are talking on this subject, brothers, because we have heard that some of you have been alarmed by certain indiscreet persons, as if your profession – in which you dedicate your life to bearing weapons against the enemies of the faith and of the peace and for the defence of Christians – as if that profession was illicit or harmful, a sin or an obstacle to greater progress! This has happened because, as we have already said to you, the devil does not sleep: for he knows that if he tries to persuade you to sin, you will not listen and will not consent. So he does not say to you, ‘Get drunk, sleep around, get into fights, slander’. You have nullified his first aim by rejecting sin. You have also destroyed your adversary’s second aim: for in peacetime you fight your own body with fasts and abstinence so that when he suggests you should feel pride in your virtuous work, you resist and overcome him just as you fight with weapons in battle against the enemies of peace who injure you or wish to injure you. So he, the invisible enemy who is always tempting you and cruelly pursuing you, strives to spoil the good work which you are performing with proper and rational zeal. As his aim is to spoil the action by corrupting your intentions, when you kill he suggests that you do it out of hatred and rage, when you take plunder he suggests that you are doing so out of greed. Each time you repulse his traps, because when you kill you have a fair reason to hate and when you take plunder you have a just reason to be greedy. I say: ‘You have a fair reason to hate’, because you do not hate humans but wickedness. I say: ‘You have a just reason to be greedy’, because it is justice to take from them what you carry off, because of their sin; and it is justly owed to you, in return for your labour. ‘The workman deserves his wages’. [Luke ch.10 v.7, 1 Timothy ch.5 v.18.] For if we are not to muzzle the oxen who are treading out the grain, [1 Cor. ch.9 v.9, 1 Timothy ch.5 v.18] why should we deny labourers their wages? If a man is rewarded for speaking words which edify his neighbours, surely a man who lays down his life to preserve the lives of his neighbours should be paid? (3) So I say: the devil has been overcome in this area. He cannot find any means of influencing you, because your action and intention are sincere. So he moves to another point of attack. Because it is not possible to deny that what you do is good, he works to prevent you from persevering in the good which you are doing, because perseverance is necessary to complete every good work. He conceeds that it is not possible to deny that it is good, but he advises you to leave the lesser good for the greater good, not telling you ‘to do that’, but telling you ‘NOT to do this’. He does not care what he says, as long as he distracts you from your plans. This is all he wants, to make you leave the place where you are. So he promises great things in order to drive you away, and when he has driven you away he will not allow you to go anywhere else nor to return to the place you have left. This is the enemy’s deception, the devil’s cunning and craftiness through which he desires to trip you up. For this reason you should stand firm and resist your adversary the lion and dragon; for he comes like a lion to break you, he comes like a dragon to deceive you. Don’t believe him! Whatever the enemy suggests is suspect, even if it seems good. Remember what that cunning persuader said to your mother [Eve]: ‘Eat, and you will be like gods’. See how he promises divinity in order to teach humanity to despise what they had. He promised majesty, in order to take away their humility. So, brothers, you who know about this first deception, be cautious and don’t be ready to take advice which promises you will rise up and grasp at divinity. Remember that you are only humans, hold humbly on to what God has given you, patiently bear what God arranges for you. (5) Perhaps it could be said that your occupation distracts you with external matters and lays an obstacle in the way of your eternal promotion and spiritual advance. You want peace and quiet so that you may bear fruit for God, for sollitude is the friend of contemplation. When you say this you show your eagerness to serve God, but your eagerness is not based on knowledge [Romans ch.10 v.2]. You do not know what you are asking. [Matthew ch.20 v.22.] Hear Christ’s reply to you, not mine: ‘You want to sit at his right and his left in his kingdom; you wish to sit and be quiet when he is reigning, but you do not wish to labour and get tired when he is fighting. What you ask would be blessed, if it were just. But because what you are asking for is not just, you do not know what you are asking’. For the order of justice demands that anyone who wishes to reign must not run away from work, and anyone seeking a crown must not avoid fighting. Christ Himself, whose example you ought to follow, before he ascended securely to Heaven to the right hand of the Father, laboured on earth fighting godless and evil people. Look, brothers: if you were supposed to seek rest and quiet like this, as you say, there would be no religious orders left in God’s Church. Even the desert hermits were not able to escape work altogether; they had to work for food, clothing, and the other necessities of this mortal life. If there was no one ploughing and sowing, harvesting and preparing food, what would the contemplatives do? If the Apostles had said to Christ: ‘We want to be free and contemplate, not run about or work; we want to be far from people’s objections and disputes’, if the Apostles had said this to Christ, where would the Christians be now? (6) So you should see, brothers, that under the guise of piety the enemy is striving to lead you into error’s trap. Men should not flee from virtues, but from sin. You should not avoid physical activity, but mental confusion. God’s servants know how to be quiet even when busy, and calm even in confusion. They know how to be content with their lot, and do not dare to resist the divine Arrangement of things, nor do they proudly oppose the divine Will. For He is Lord, and we are His servants; and He has put each of us in His great house, and the law is that whoever discharges their duties most humbly will receive the greatest reward. But now the enemy’s temptation never leaves people’s poor hearts in peace. He suggests to the leaders that because they hold positions of authority they have no hope of winning salvation, and he suggests to the more inferior that they have a right to resent being under the leaders’ authority. He says to the lords that they cannot be saved unless they leave their responsibilities as rulers, and he says to the servants that they cannot not share in religion because they have no share in lordship. Oh deception of the enemy, when will you cease? How does the angel Satan transform into an angel of light? [II Corinthians ch.11 v.14.] If the devil tried to persuade them to reach out for worldly ostentation, his deception would be easily recognised; but now he tells the knights of Christ to lay down their weapons, not to wage wars, to run away from uproar, to seek the secret place – so that he can take away their true humility while pretending to offer an appearance of humility. For what is pride, if it is not refusing to obey what God has commanded you? See how many forms his deception takes, brothers, and how he uses every type of deceit. He makes these people who are well-known leaders complain, and those people who are unknown subjects complain, as if they were not recognised by God because they are not mentioned by people. See this, brothers, because this makes your tempter foolish. For I reckon that no wise person among you does not know that the more secret any virtue is, the safer it is. None of the faithful should doubt that anyone in any company placed among those who serve God and who shares their labours will certainly share in their reward. May you perceive this, dearest brothers, and preserve the peace of your company, and may the God of peace be with you. THE END. Text from: Jean Leclercq, ‘Un document sur les débuts des Templiers’, Revue de l’histoire ecclesiastique, 52 (1957), 86-89. See also Dominic Selwood, ‘Quidam autem dubiterverunt: The Saint, the Sinner, the Temple and a possible chronology’, in Autour de la première croisade, ed. Michel Balard (Paris, 1996). Simonetta Cerrini, ‘Le fondateur de l’ordre du Temple à ses frères: Hugues de Payns et le Sermo Christi militibus’, in Dei gesta per Francos: Études sur les croisades dédiées à Jean Richard – Crusade Studies in Honour of Jean Richard, ed. Michel Balard, Benjamin Z. Kedar and Jonathan Riley-Smith (Aldershot, 2001), pp. 99-110. This translation was prepared by Helen J. Nicholson. We thank Professor Nicholson for her permission to republish this text. 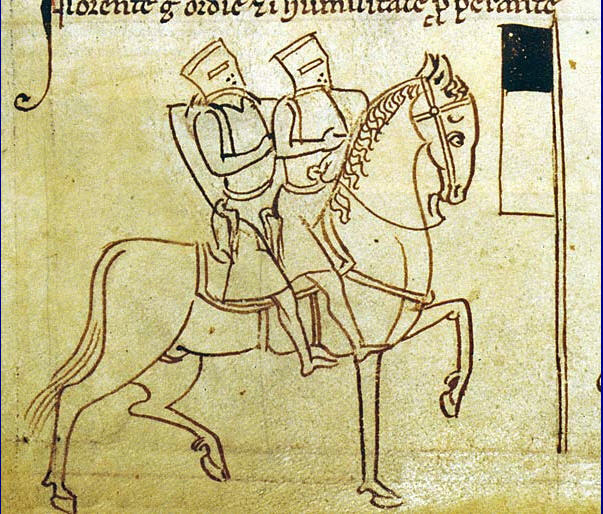 This entry was posted in Primary Sources and tagged 12C, Crusades, Templars. Bookmark the permalink.